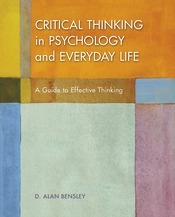 Critical Thinking in Psychology and Everyday Life shows how a scientific, critical thinking approach can be effective in addressing psychological questions, and discusses other questions that straddle the boundary between science and non-science. While scientific, critical thinking can be effective in addressing psychological questions, this textbook is a guide for how to separate fact from speculation and true claims from misconceptions and misinformation. Covering a wide range of topics, this book seeks to engage students in a serious search for answers, using what psychologists and other scientists know about how to think effectively. What does science have to say about whether some people have special psychic abilities, such as being able to “see” the future? Can people use their minds to move objects without any physical aid? Does the mind actually leave the body during an out-of-body experience? You may be surprised to learn that we are tantalizingly close to a scientific answer to this last question (see Chapter 7).